Thousands of Dalits - low-caste Hindus once known as "untouchables" - have embraced Buddhism at a ceremony held in the city of Baroda, in the western Indian state of Gujarat. Although organisers of the event had claimed around 100,000 Buddhists would turn up for the event, the number did not exceed 6,000. One of the organisers, the national general secretary of the Vishwa Buddha Sangh (World Buddhist Council) Bhente Sanghpriya, told the BBC that numbers did not matter. "What matters is the Dalits coming forward to claim their status as a human being," he says. One of the converts, Sheelaben, a resident of Baroda, said: "I am tired of worshipping imaginary deities who have never come to save people like us." She pointed out that, since Dalits are poor and live close to Muslim residential areas, they are often attacked by Muslims who take them to be Hindus during communal riots. The ceremony held on Sunday had been scheduled for July but was postponed. Most of the Dalits asserted that, once they become Buddhists, they will not have to follow the rituals and traditions of Hindus which are often a costly affair. ''I will not have to pay a Brahmin priest for conducting my daughter's wedding ceremony," one woman said. "I will not have to follow the custom of giving a large dowry to her." 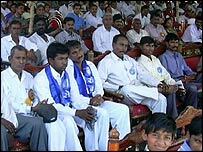 Caste has been a contentious issue in Gujarat for several decades. Even in elections, caste factor plays a major role in deciding the winners and, later, the chief minister and his cabinet colleagues. The ceremony held on Sunday was the culmination of a Dalit awakening drive across the state that started on 31 August. Bhente Sanghpriya said his organisation will lay emphasis on opening educational institutions in all the 26 districts of the state. 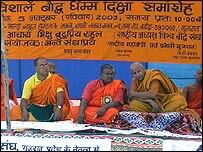 He claimed that by the year 2005 he will get 10 million Dalits to embrace Buddhism.